I dare you to tell me you don’t love this soup! This copycat recipe from Tornadough Allie is crazy easy to make and super delicious! Does an Olive Garden copycat recipe get bonus points if you can make it in the crock pot? Because I think it does! This one from Homemade Hoopla looks absolutely to-die-for! Right here folks, this one is my absolute favorite pasta to snag from Olive Garden! This copycat recipe from Six Dollar Family is a must see! My only warning with this one is that you very well eat the entire thing! So pace yourself…if you can. Another Olive Garden copycat recipe that I can make in the crock pot?! Sign me up! This recipe from Recipes That Rock looks sooo tasty and so simple. Plus it looks perfect for those colder winter days! The Cozy Cook nailed it with this recipe (and all the photos.) She also includes great tips for non-alcoholic Marsala suggestions and other substitutes! These copycat “grilled” chicken tenderloins are actually not even grilled! Dear Crissy has kept this recipe simple and delicious! I mean so simple there are only 4 ingredients! What is it about certain places…their mac and cheese is just better than the rest? Cracker Barrel is well known for this and this copycat recipe from Call Me PMC has nailed it. Confession: I am a former bread addict. All things bread and biscuits for me. The tough part about this is, whenever I was craving a certain type of bread, it seemed like every recipe made me wait for it to rise! Yeah, no thanks. This recipe from Genius Kitchen has barely any wait time and yet, the biscuits look perfect! So maybe you want to get a little greens in on the side of all these carbs? Well, CD Kitchen has nailed this country green beans recipe from Cracker Barrel. There is no doubt. Who doesn’t love cheese hash browns? This recipe from Cincy Shopper is the perfect way to really indulge yourself! Plus, there is plenty to go around! If you feel like sharing. The Cincy Shopper not only rocks at hash browns, but she nailed this copycat Chik-fil-A sandwich as well. I have to say, just seeing how perfect this chicken breading looks makes my mouth water! No Chick-fil-A meal would be complete without the famous sauce, am I right? This recipe from House of Yumm has got you covered. You’ve got your sandwich, you’ve got your sauce, all you need is some waffle fries! Okay, I think it’s fair to say that Cincy Kitchen is becoming the queen of copycat recipes. This recipe for Frosted Lemonade is like the stuff that dreams are made of. Perfect for a hot summer day! The Baker Mama finally got her kids eating something besides chicken nuggets when she recreated this copycat Chick-fil-A chicken tortilla soup and it’s pretty easy to see why! I think I can fairly say that this particular recipe from Cincy Kitchen would have my husbands stamp of approval. Any restaurant that serves bread before the meals has always held a special place in my heart. This copycat recipe from Kitchen Trials for Honey Wheat Brown Bread looks simply perfect. Light, fluffy and delicious. Is it too much to dream that I always thought the Cheesecake Factory only had cheesecake? Well, Favorite Family Recipes knows better because they recreated this amazing Chicken Madeira copycat that you will gobble up for sure! You know when cartoons have their eyeballs pop out of their heads? That’s how I feel when I look at this recipe from Flavorite! This hearty homemade recipe looks absolutely perfect for a get together or a nice sit down family dinner. Don’t tell me you thought we were going to make it through all of the Cheesecake Factory copycat recipes without actually mentioning cheesecake!? I’m not a total loon! Tornadough Allie had this copycat recipe for Reeses Peanut Butter Chocolate Cake Cheesecake that you just can’t pass up! Now don’t judge me, I have never tried carrot cake! But I hear that Cheesecake Factory’s Carrot Cake Cheesecake is the absolute best! This recipe from Genius Kitchen definitely makes me believe the hype! Simple Southern Mom has got the absolute perfect Panera copycat French Onion Soup that you will die for. She even throws in some homemade crouton ideas if you’re feeling extra capable! I mean who doesn’t love a good homemade chicken noodle soup? True to the name, Eating on a Dime has a perfect, affordable Panera copycat Chicken Noodle Soup. Alyona’s Kitchen really got the cream factory right on this copycat recipe for Panera’s Baked Potato Soup! I am always a fan of tasty treats from my favorite restaurants and this one from The Semi Sweet Sisters is no exception. You have to admit Panera’s bakery case is like the sweetest form of torture. So why not bring some of it home to your very own kitchen? If you are more a fan of Panera’s breakfast than anything else than this recipe from Tastes of Lizzy T will be right up your alley! Ladies and gentleman, meet my first addiction. There are so many recipes for Cheddar Bay Biscuits and you can even buy a mix now in stores but this recipe from A Spicy Perspective is the absolute #1 recipe for Red Lobster copycat recipes so, I think it’s worth a shot. These photos alone from Damn Delicious makes me want to run to the store and buy all the ingredients for these delicious Red Lobster copycat shrimp scampis. Confession: back in the day I was one of those people who go to Red Lobster and order a chicken pasta. So silly. Especially when they had amazing dishes like this Crab Alfredo from All She Cooks. Genius Kitchen does it again with this Red Lobster Copycat Lobster Pizza. I mean can you ever really go wrong with pizza? To finish us off with Red Lobster copycat recipes, these Crab Stuffed Mushrooms from Home Family Recipes are literally going to make your mouth water. I know Starbucks isn’t a restaurant, but there is no denying that most people tend to way over-spend at Starbucks. So, learn to make these tasty treats at home and start to save money! At the top of the list of course is a frappuccino! This copycat Double Chocolate Chip Frappe from Life is Poppin is absolutely spot on. Another top frappuccino to order when at Starbucks is the Caramel Frappe. This recipe from Eugenie Kitchen is so simple and perfect you can easily start making this tasty treat at home on the go! Plus, who doesn’t want to do that caramel drizzle on top? I am personally a sucker for Starbucks cold tea drinks! While the Cool Lime Refresher is probably my favorite, this copycat Passion Tea Lemonade from Bargain Brianna looks pretty ahhhmazing. As a recovering chocoholic, lemon is the one thing that keeps me going. Lemon anything is ok in my book. So there is no doubt this Let the Baking Begin recipe is just as yummy as the Starbucks version. Like I said, I can stop eating out, save money and actually get more lemon loaf cake than I would have if I left the comfort of my own home! Whenever we happen to stop by Starbucks my kiddos always try to snag themselves a cake pop. I can’t blame them. I’ve tried other cake pops but Starbucks has really nailed them. Especially the salted caramel ones! This one you can find on Instructables is all I need to keep my kiddos (and me) happy. If you haven’t been to Applebees recently, you might want to go just for these little gems! Allrecipes has a super yummy copycat recipe that you can try out at home first just in case you don’t believe me! Maybe you were wondering if there was a meal I could eat all day every day. Well, if you were it’s this Fiesta Lime Chicken recipe from These Precious Days. This recipe is my go-to when I am craving this chicken plus you can save a ton of money by making it in bulk! Trust me, I know. No restaurant visit is complete without garlic mashed potatoes in my book. 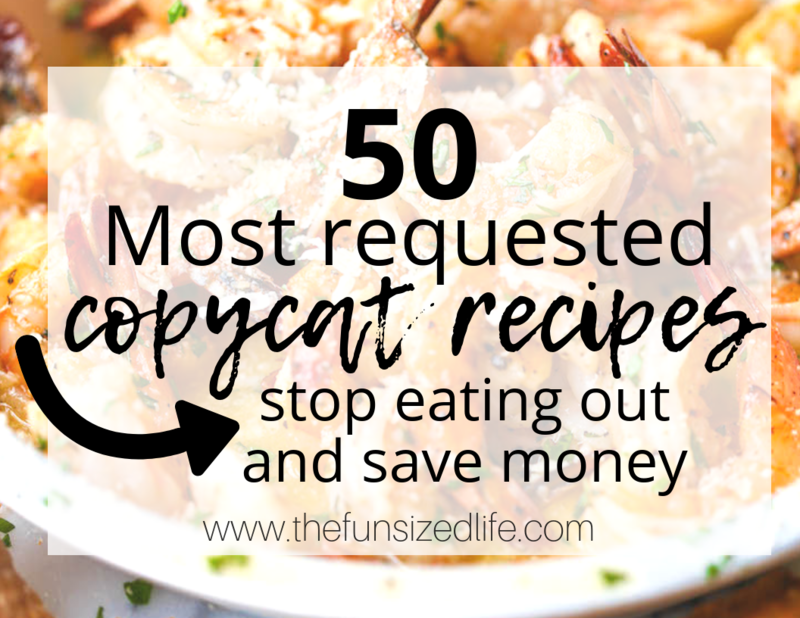 That’s why this copycat recipe from Just a Pinch is a must have! The Genius Kitchen strikes again with this amazing copycat of Applebees beloved appetizer, the spinach artichoke dip! I’m pretty sure I could happily never eat out again now that I have access to this recipe. If you’re hoping for something on the lighter side, you have to snag this copycat recipe from Lil Luna. She makes everything super simple and extra delicious. Save some money and make your own restaurant worthy salad at home! I’m not going to lie, I have never actually tried the Mongolian Beef at PF Changs, but this recipe from Spicy Southern Kitchen definitely makes me want to try this ASAP. No oriental food is complete without some seriously delicious noodles, am I right? Naturally the Genius Kitchen has already thought of this and came up with this super yummy copycat Garlic Noodle recipe so you can stop eating out and starting dining in! Dinner then Dessert decided to totally knock our socks off with this awesome PF Changs copycat Orange Peel Chicken Recipe. People like this are the reason I love to eat so much I tell you what. If you’re going to eat vegetables, I’m pretty sure this is the way to do it! This recipe from Domestic Superhero is absolutely perfect for indulging while also sneaking in some greens. I won’t lie, the first time I saw this copycat recipe was the first time I decided maybe lettuce wraps were something I should be a part of. It is a Keeper has the perfect recipe to keep the carbs low and the satisfaction high with this awesome copycat. For me, I saved the best for last. I could easily eat Mexican food every single day of the week and not bat an eye. Chipotle’s burrito bowls give me all I need from life so let’s work our way through how you can make your own at home and save money! First thing’s first, let’s start with this amazingly delicous rice. The perfect way to start any kind of Chipotle burrito bowl. This recipe is from The Kitchen Girl. Crock Pot. These two words are as romantic to me as “bed time.” I know we don’t all have a ton of time to stand over a hot stove every night and that’s when this recipe from What’s Cooking America comes in handy for your at-home, save money Chipotle night. Dinner then Dessert has another winner for us! This is a recipe my family and I frequently use for our Taco Tuesdays! It is so good, spot on and just look at that layering. If anything could convince you to stop eating out, it’s this photo right here. Maybe I’m boring, but my personal favorite at Chipotle is the chicken. The Brown Eyed Baker has a super yummy, extra flavorful recipe so you can get the exact Chipotle chicken flavor that you crave. Ok, let’s stick with the slow cooker theme and toss in some pork. I mean, I want you to have variety in your burrito after all. The Slow Roasted Italian has another low maintenance, but super yummy option for you!